13 TV eps., 2 OVA eps. 13 TV eps., 2 OVA eps. The above info came from Jessica, and was edited by yours truly (contact me). The image came from Asylum Anime. 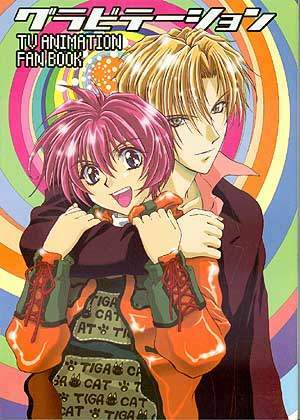 Gravitation is a 13 episode anime featuring Shuichi Shindou as the main character. Shuichi is part of a rock band called "Bad Luck" along with two other teen boys. He's quite talented and writes the lyrics for the songs that Bad Luck plays. On his way home one day, he meets Eiri Yuki, a popular and handsome writer. Shuichi's newest lyrics were read by Yuki, who insults them and tells Shuichi that he has "zero talent." Shuichi pursues him and inadvertently falls in love with Yuki. He loves Yuki with all his heart, despite his being a male, and loves him as much as he does singing. He would go to great measures for Yuki, and he eventually surpasses all of Yuki's former lovers with his strong love for the handsome writer. Yuki however has a stubborn personality and rejects Shuichi in the beginning. Later on he falls for him and his cuteness as Shuichi decides to move in with him. Meanwhile, Bad Luck has been rising to the top of the music world with their hit new song "The Rage Beat." Controversies begin to occur just as their songs hit the top charts. The media is curious of whether the relationship between the popular writer and the equally popular singer is real. Rival bands begin to get jealous of Bad Luck's popularity. A member of their rival band, ASK, is out to make sure Shuichi and Bad Luck doesn't surpass them by threatening Shuichi of Yuki's reputation. Shuichi must learn to overcome these obstacles, keep Bad Luck together, and retain his relationship with Yuki. But what Shuichi doesn't know is that Yuki hides a terrible secret, and once Shuichi finds out, will he still love Yuki? The above description came from Dare to Dream (used with permission), and was edited by yours truly (contact me).